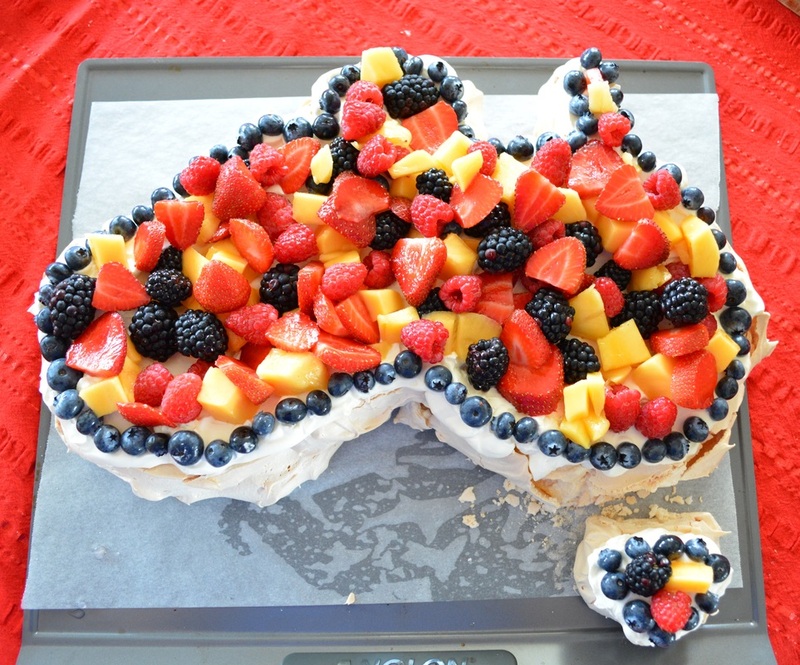 Ever since I started making pavlovas, I have always made one for Australia Day, it just is the ideal day for it. It is in summer, all the fresh fruit is cheap and readily available, and it is a nice light way to end an Australia Day lunch. Usually though, it is my normal rectangle version. This year however, I came across a version in the shape of Australia. I knew I had to give it a go, as that is what I do. 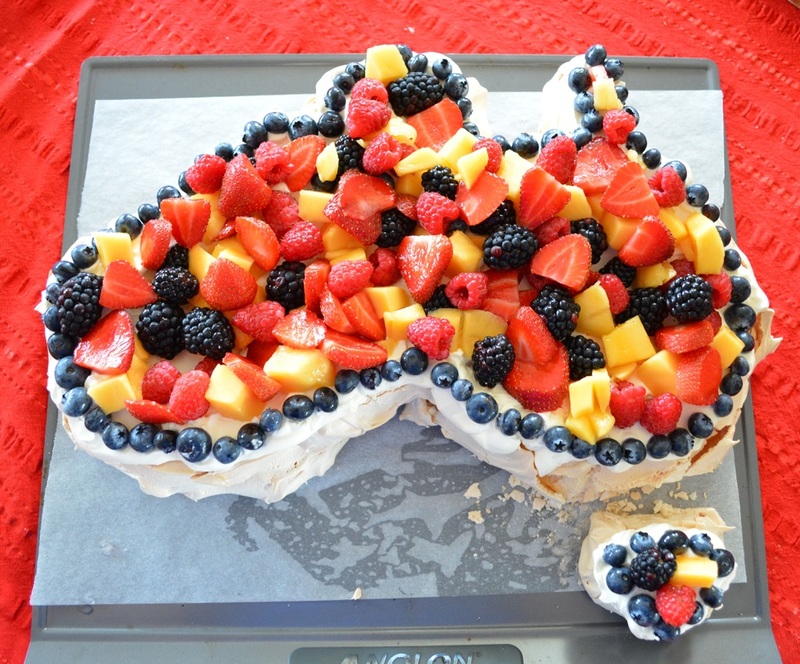 So I used my normal pavlova recipe, downloaded a template of the map of Australia, and I did it. I think it looked sensational. I loved how it turned out. 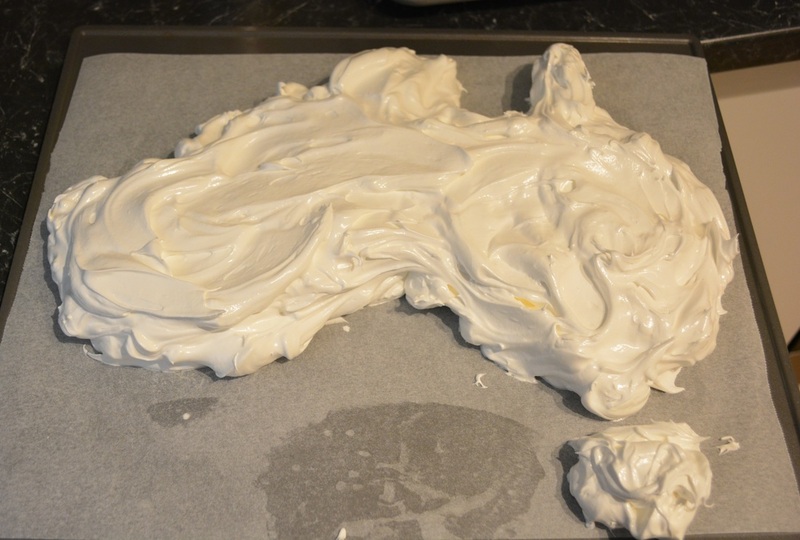 It was quite simple to make, you just need to shape it carefully, and a little care was needed when adding the cream as not to disturb the meringue. Also in the original recipe it stated you should carefully transfer it to a plate to serve. Now, I was never going to do that as 1. I was scared I would break it and 2. it was quite large, so I didn't have the right plate for it. So I happily served it off my baking tray. So if you are thinking of trying this, you should, it was quite simple, you just need to take care when shaping the pavlova. Also with decorating it, I was considering using different fruits for different states, but last minute decided to mix it up. So decorate it however you like. Line your baking tray with baking paper, place your map underneath your baking paper as a guide to shape your pavlova. (Remember to remove your printed map before baking). In a large bowl of an electric mixer place the egg whites and salt. Beat on medium-high speed until you have soft peaks. Slowly start adding the caster sugar-a tablespoon at a time, until it has all been added. Scrape the sides of the bowl now, then continue beating until your egg mixture has stiff glossy peaks. Add the cornflour, vinegar and vanilla. Carefully fold the mixture until all is combined. 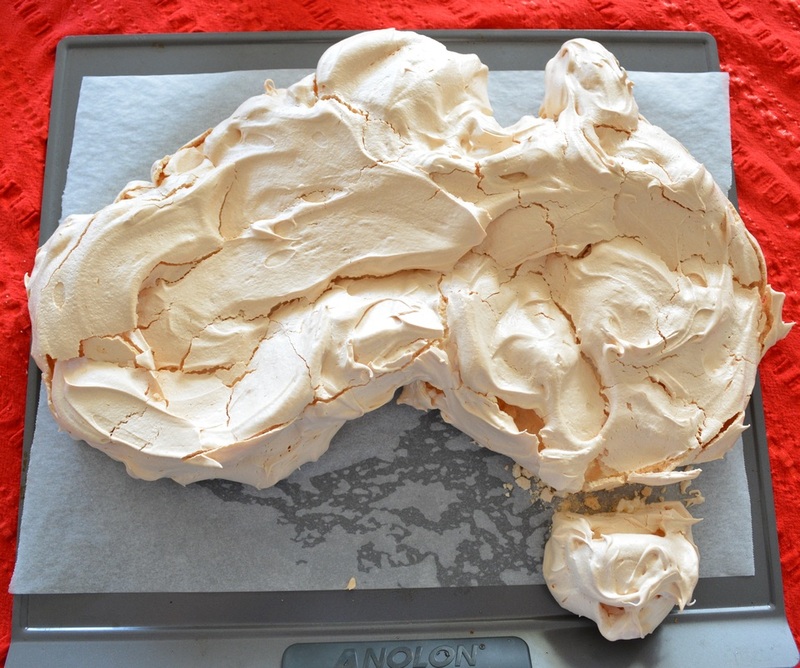 Spread the meringue onto your baking tray inside of your Australia map borders. Once it is inside of the map, start shaping the pavlova. Shape the edges of your pavlova by smoothing the sides in an upward motion, towards the centre. This will help hold the shape of your pavlova. Bake for 30 minutes, then reduce the temperature to 140C and bake a further 40 minutes. Turn off the oven, slightly open the oven door and allow the Pavlova to completely cool in the oven. Just before serving, whip the cream, until light and fluffy, spread it over the meringue. Top with fruit of your choice. Serve immediately.